I met my friend, teacher and fellow Pardes alumna Rabbi Shawn Fields-Meyer during the summer before I arrived at Pardes, as a participant in the Brandeis Collegiate Institute. Inspired by her teaching and hungry for more, I sought her out. When I told her that I was on my way to Pardes, she responded, “Oh! You’ll be FINE! Pardes is the beating heart of the Jewish world. You’re going to get everything there that you are looking for.” And, she was right. At the time, I was a Jewish young adult, raised within the magical combination of Jewish day school and summer camp. I was Jewishly affiliated, dating the Jewish man (fellow Pardes alum, Hyim Brandes ’00-02, ‘04-05) who would one day become my husband. I had studied Religion and Bible as an undergraduate at Emory University. In all of that time, I had learned just enough about Torah to know that I knew almost nothing at all. I had studied Hebrew, but could not speak Hebrew with confidence. I had studied Bible stories, but felt no ownership over our shared Jewish library. Pardes changed all of that. During my first year at Pardes, I felt as though I was inhaling Torah. At the time, I often used the analogy that after years of accessing Judaism from the outside, Pardes was like an Jewish IV drip. Torah just flowed in, giving me new life. My teachers at Pardes became my rabbis. My hevrutot became my life-long friends. There is a bond that unites Pardes alumni, whether or not we were in the Beit Midrash together. For me, it is more powerful even, than the bonds of movement that tie me to my Conservative colleagues. Regardless of our background and level of observance upon our arrival at Pardes, while there, we learned what it meant to be a “halakhic Jew.” Zvi Wolff taught us about “pork-tatoes” and we learned that Jewish practice was determined by a rich, complicated and varied history. That some of us showed up at the mechiza minyan for mincha, others in the egalitarian minyan, while others still used the time as a break, was far less significant than the greater truth we were assimilating – that Jewish action matters; that Judaism offers us a path, a way to sanctify the daily moments of our lives. Such a path could be excavated in the sacred texts of our tradition, if the right attention was given to the matter. It is my belief that this commitment to being a “halakhic” Jew, not an Orthodox, Conservative, Reconstructionist or Reform one, is the reason that so many of my fellow Pardes classmates have founded the majority of the independent minyanim around the USA, are Chairs of Jewish Studies and Heads of School in Jewish Day Schools, and fill the clergies of all of the major Jewish movements. Commitment to the belief that Jewish practice finds its roots in text and its flourishing the construction of a meaningful life animates my own work as a rabbi today. As the West Coast Regional Director at Moving Traditions, we work to offer Jewish text and tradition a resource for teens in their coming of age process. As founder of the Neshama Center, a spiritual mikvah and spa, I offer mikvah as spiritual practice, an encounter with body, intimacy and self, and most importantly, a vehicle for the construction of a meaningful life. It is a vision I developed during my years at Pardes and one that is animated to this day by the inspiration I found in the Beit Midrash there. My Jewish soul was born at Pardes. I will be forever grateful for my time there. Rabbi Sara Brandes lives in Los Angeles, CA, with her husband Hyim, and two children, Michal (5) and Gavi (2). She is West Coast Regional Director at Moving Traditions, and is working to build the Neshama Center, a spiritual mikvah and spa. She is a member of the inaugural cohort of PresenTense LA, a certified yoga instructor and the spiritual leader of the independent cooperative, Minyan Kol Chai. 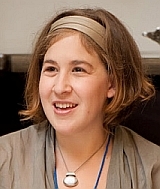 She blogs on Embodied Jewish spirituality at www.thejewishbody.org.